Dear friends, there are so many things to be said. These past few days I've been sick. Again. For the past few years, I've entertained a vicious cycle. Sign up for a zillion things that I don't have time for (but just can't pass up or not be involved in! ), get overwhelmed, decide that nothing can be cut, figure out how to "do it all" while spreading myself too thin, get sick, get better, keep pushing through, make it to the summer. Rinse, repeat. And y'all, I'm tired of living that way. It's not healthy. I make excuses, but what it comes down to is that I am afraid of disappointing people. Of not having enough to do. Of not having a life. All silliness but all true. But this is the second time I have been sick in the last eight weeks. And that is not okay. My body is a temple of the Lord. And if God Himself rested after making the heavens and earth and all He had to do was speak them into being, then I most likely need to get myself some rest, too. I'll be sharing more details about what that looks like for me soon...right now I am so excited to announce a true honor the Lord blessed me with a couple weeks ago. Shauna Niequist is by far one of my favorite authors. Actually, she is probably my favorite. I'll just go ahead and say it, she's my favorite author. I've mentioned her here and here and in other hidden spots on this little blog. Her writing is so honest; when you read her words you feel like you are talking with an old friend. It's like she climbs into my brain, takes my feelings and thoughts and struggles, and pours them on paper. Beautifully. I laugh, I cry, and I am challenged. It's magical. 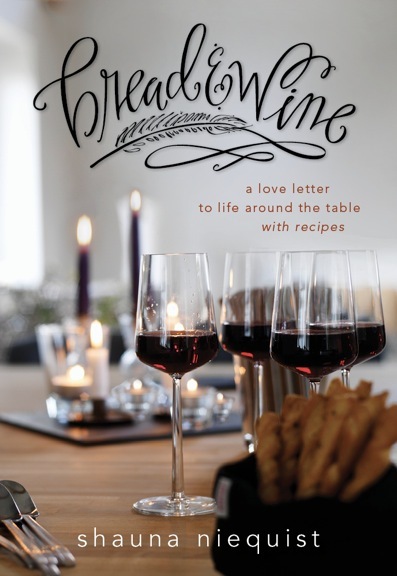 Well, friends, Shauna's new book, Bread and Wine: My Love Letter to Life Around the Table, with Recipes is coming out on April 9, and I am an early reader! I will be reviewing the book and telling you about how much I adore it. :) And I was already prepared to pre-order it on Amazon. Ha! So that means that in the next few weeks, I'll be posting about what spoke to me through the book and telling you about why you need to get it as soon. as. possible! All I can tell you right now is that I have only read the introduction but was already crying at those few pages. This blessing couldn't come at a more perfect time; her words are so in sync with what the Lord has speaking over me. He's so good like that. Sarah I love that song! Thank you for sharing! Just added all of Shauna's books to my amazon wishlist after checking out her blog. Hope you feel better soon! Slowing down is so difficult when so many people tell you what you should be doing... so much guilt-tripping at school. Love you lots! Wow, that is so cool you get to be an early reader! Can't wait to hear what you think about it. The book looks beautiful and inspiring. Praying that you feel better soon! This is awesome! And EXACTLY what I needed to read - a complete testimony to what I've been struggling through and learning about in this specific season of life. I can't wait to hear about how God moves through this time for you. (And...who knows...we could talk about over a cup of coffee in Cafe 1040? Oh the glory!! Haha!) I love you, precious woman!